My Razer Huntsman Elite will sometimes repeat key strokes or key strokes will get stuck / spam. My Razer Huntsman Elite has unresponsive or stuck keys. Please ensure your wrist rest is aligned and securely attached to your Razer Huntsman Elite. Razer has also released a firmware update to help address this issue. Please click here for details on installing the firmware update. Is the Razer Huntsman Elite supported by Synapse 3? 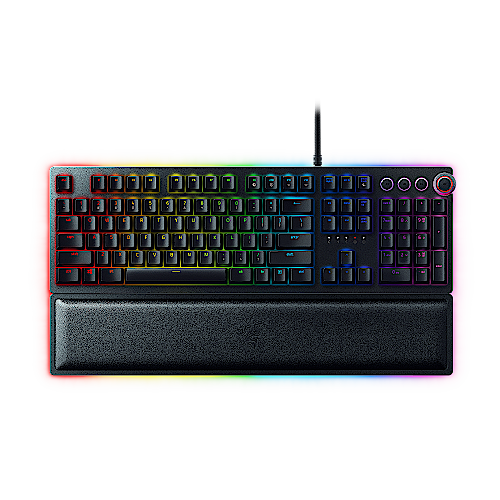 What switch type is used in Razer Huntsman Elite Keyboards ? The Huntsman Elite uses the new Razer Opto-Mechanical™ switch. Is the Razer Huntsman Elite a USB-3.1 keyboard? Does the Razer Huntsman Elite keyboard have on-board memory? Does the RGB LED wrist rest on the Razer Huntsman Elite require battery to power it? No, the wrist rest LEDs are powered by a proprietary pogo pin connection. Simply aligned the wrist rest and connect it directly to your keyboard to switch on the wrist rest underglow. Please ensure both USB connectors are plugged into your computer. Can I connect only one of the USB connectors on the Razer Huntsman Elite instead of two? Yes, you can use only the “RAZER” labeled USB connector by itself. However, only the keyboard’s key backlighting will light up and not the wrist rest underglow. Otherwise, you will have full keyboard functionality when using only the one USB connector. Can I connect my Razer Huntsman Elite via a USB hub? It is advisable to plug both USB ports either directly to your PC or a powered USB hub. Is the wrist rest on the Razer Huntsman Elite made of leather? The wrist rest material is made of leatherette material. No latex is used in the wrist rest. Is the wrist rest on my Razer Huntsman Elite uniquely paired to the keyboard? No, the wrist rest is not uniquely paired to the keyboard, meaning you can use your wrist rest with any Razer Huntsman Elite keyboard.